Well. Its the end of another day in front of the computer where it feels suspiciously like maybe not enough got achieved. Not for lack of putting in the hours mind you! There were tea and snack breaks along the way but certainly lots of techno black holes too.. Fascinating Balinese architecture by the sea. All this whole brave new world of online, well, everything! is quite a learning curve for me at the moment.. I am becoming more adept by the day at Google search terms like “How to start your own online business” and “How to source Fair Trade products” “What is SEO?“…. And all manner of such often blindingly boring search queries. And I am also learning stuff. Lots of it! Which I definitely enjoy. I also am looking forward to getting more on top of it all.. So. What is “it all“? I am in the ongoing process of getting my new business going which, in a typical fashion for me, has actually become two businesses in one.. What the? I know I know.. Kinda convoluted but there is an explanation. I have a love of jewellery and started Ruby Ripe to see if I could make a go of trading in my own hand made jewllery designs and sourced pieces. Before moving back to my home region in the end of 2009 I had been managing a jewellery boutique in Cairns, Far North Queensland. It was a great place to work which I left to (literally) go off sailing into the sunset.. Unfortunately by the time we reached the Whitsundays I realized I was terrified of the ocean and quite prone to sea-sickness.. So that particular adventure didn’t work out as I was dreaming. And, as I was totally horrified at the idea of becoming a peddler of cheap junk from China, the only option I felt that was open to me was to get involved in Fair Trade and ethically sourced products. Hence Modern Artifacts was born..
My apologies – I tried to be as brief as possible! – in conclusion; why the two storefronts? Basically it is really hard to source and supply genuine “fair’ jewellery due to a whole spectrum of issues (mining practices for gems, difficulty in following the supply chain etc etc). So, although many items from the Ruby Ripe collection will and do pass muster for the Modern Artifacts range, some need to be kept separate. And there is the crux of Modern Artifacts..Integrity is paramount and it has been and will continue to be a fascinating and ongoing learning curve finding products which I am happy to ascribe to the Modern Artifacts collection. I will leave it for another day to describe in detail but I am really enjoying getting to work with a great selection of very interesting and worthwhile projects – and being able to put my money where my mouth is so to speak! One of the artists at Surjomukhi in Bangladesh making beautiful kids dress-up hoods which I have sourced for the Modern Artifacts collection.The organization presently has 25 artisans, the majority being women. An idea that had been floating in the periphery came to fruition – due mostly to a “what the hell” desire and a Skype conversation with one of my best friends who is currently in Mexico looking for a sailboat.. I booked myself a trip to Bali! I am so so so excited! I cant wait! I have been enjoying and learning from all this ‘virtual’ research but have come to a point of wanting to cut my teeth a bit and see whether I can make my dream of running an environmentally and ethically sustainable enterprise a reality. Need to shake up my bones a bit – haven’t been out of the country in four years and I think I need a dose of developing world reality check! And I am so excited to be going with the sole intention of endeavoring to forge a way to contribute to my destination in a positive way. 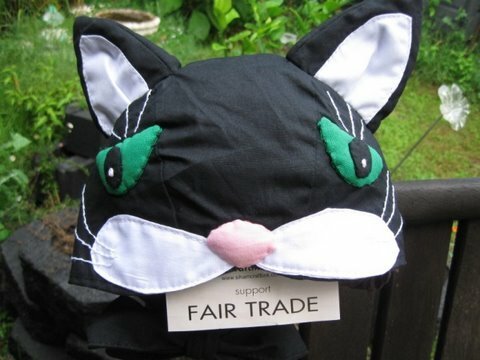 Cute as a kitty Cat hood made by the artists at Surjomukhi, a fair trade organization which was founded in Bangladesh in 1994. So, before you say it – yes I have considered the carbon footprint of an overseas trip! 🙂 However I have decided, after much thought, that it is quantifiable in my greater goal of setting up trade ties with one of our closest neighbors who also happens to be quite a poor one. Interestingly enough when I checked it out, Indonesia actually has a higher GDP than Australia! Yet, according to Mercer (Mercer Human Resource Consulting) Australia has jumped 10 places this year to be ranked 14th most expensive city to live in in Asia Pacific (due in the main to the Australian dollar having gained almost 14% against the greenback). Jakarta, in contrast, is ranked 69th (these are out of 214 cities by the way, with Karachi in Pakistan being the least expensive). Sublime cermaics produced by a certified Fair Trade producer group in Bali called Mitra. However statistics like the fact that the average person in Bali lives on $2 a day compared to the average tourist ‘surviving’ on $100 a day paint a different perspective. In any case… I am busy researching interesting initiatives to visit whilst there and I cant wait! Just getting my fingers warmed up really 😉 gosh its cold tonight! That will be a different story come August 10th when I touch down in Denpasar…. Did I mention that I cant wait?!! 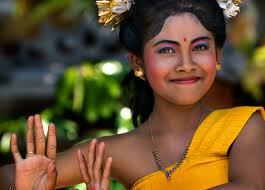 Gorgeous Balinese girl. I can't wait to meet and explore Bali and her people and places..